With very little run-up distance, you can chain up two pedal kicks to assist your weight-transfers over the front wheel before you stick the front wheel onto the upper edge of an obstacle. 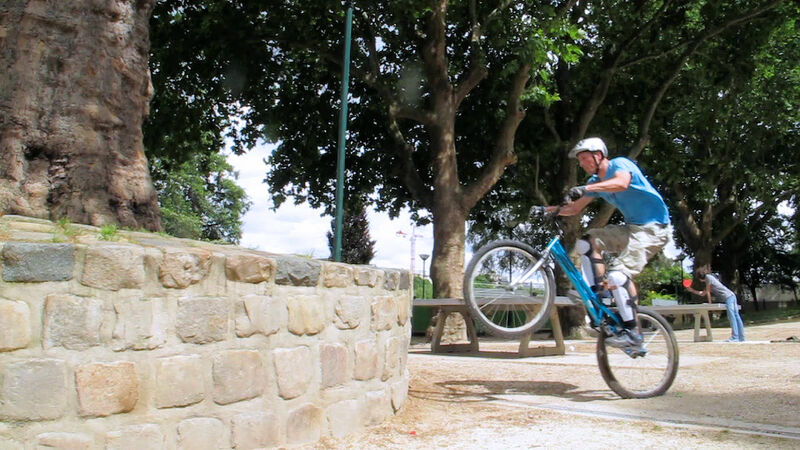 Vincent Hermance regroups over the front wheel to tilt the rear wheel up. Vincent Hermance leans forward has he launches a pedal up. Get your marks right with enough run-up distance to launch a pedal up while aiming the front wheel at the upper edge of the obstacle. 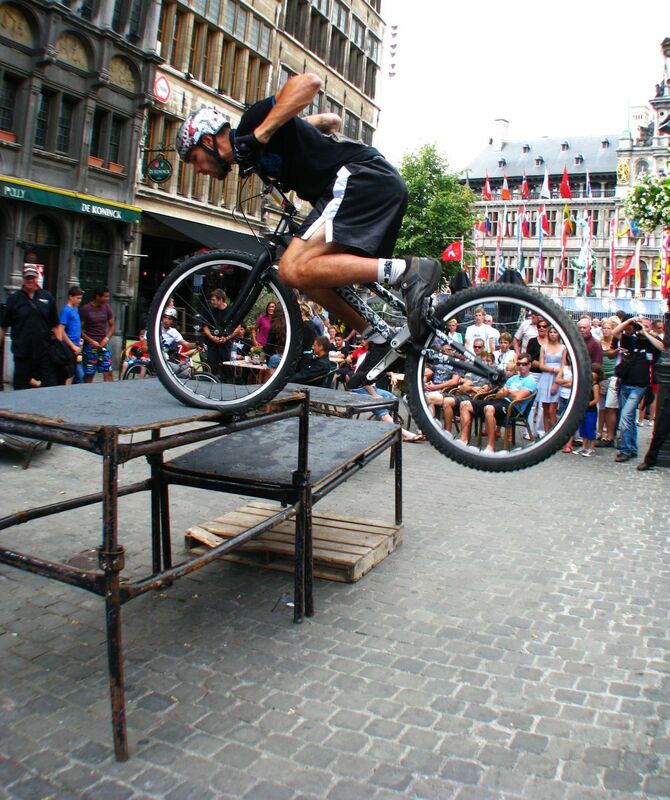 At about a bike's length from the obstacle, aim the front wheel as if you were going to roll up the obstacle, stay supple and flex down before the impulse. Spring up into a full extension upward, thrusting your hips and shoulders as you accelerate on your good pedal, like in a regular pedal up. 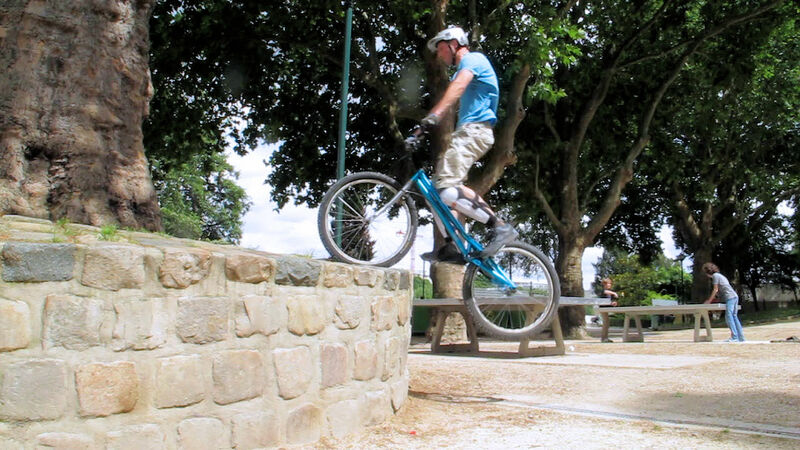 Pull the bike up with you as you finish up your extension and aim the front wheel right at the obstacle's edge instead of trying to pull the rear wheel up. Janos Boudet tucks nearer the stem to tilt the bike. When the front tyre touches down on the obstacle, lock the brake and use your momentum to tilt the bike forward. Transfer your weight over the front wheel to lift the rear wheel further. Tuck your knees as much as you can to bring your hips closer to the stem and keep your shoulders moving forward. Then release the front brake and extend your arms to finish with a wheel swap. 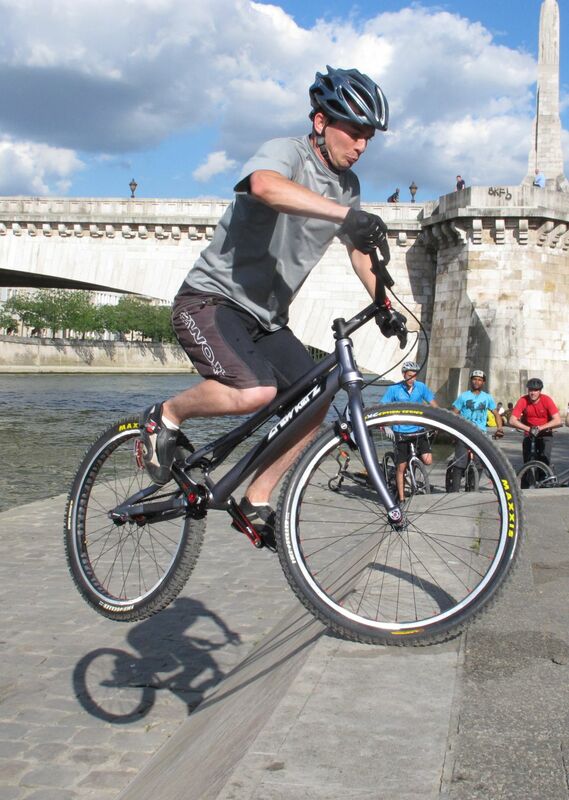 Rather than focus on lifting the bike up by just tucking your knees during take-off, you should focus on transferring your weight over the front wheel as it hits the obstacle. This is a very different way to terminate the move compared to a regular pedal up to back wheel. 1° Get your marks right with enough run-up distance to launch a pedal up, lifting the front wheel on your lazy foot. 2° At about a bike's length from the obstacle, aim the front wheel as if you were going to roll over the obstacle, stay supple and flex down before you accelerate. 3° Spring upwards, thrusting your hips and shoulders up as you accelerate into a full extension on your strong foot before take-off. 4° Pull the bike up with you as you finish up your extension, aim the front wheel right at the obstacle's edge instead of pulling the rear wheel up. 5° As the front tyre hits the obstacle, lock the brake and use your momentum to tilt the bike forward. Transfer your weight over the front wheel to lift the rear wheel further. 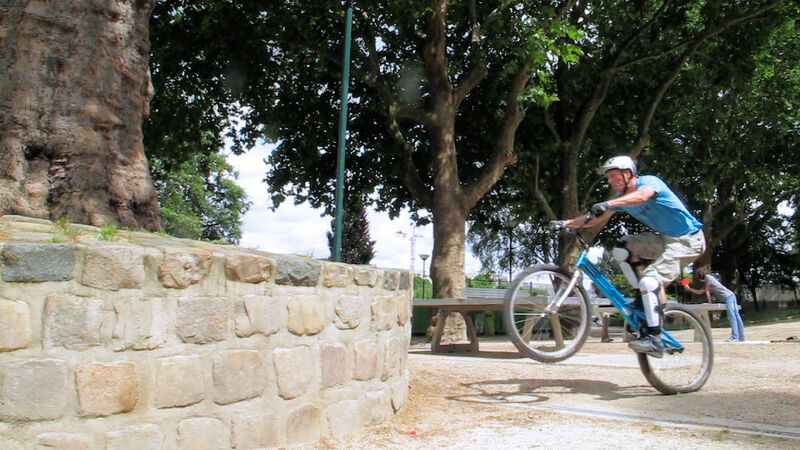 Tuck your knees. 6° Keep your shoulders moving forward over the obstacle, then release the front brake and perform a wheel-swap with a firm push-up to secure the rear wheel onto the obstacle. Benito Ros ready to release the front brake. Janos Boudet about to perform a wheel swap to rear wheel. 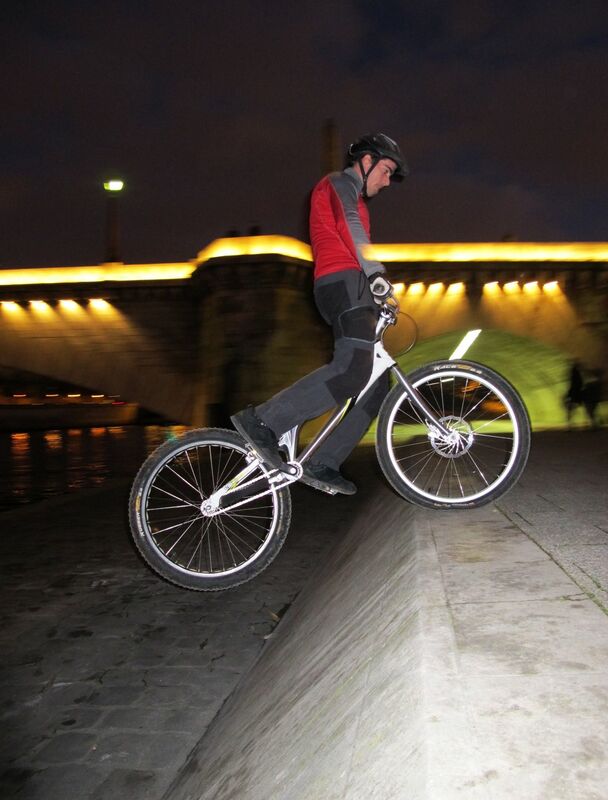 The second pedal hop impulse is necessary to boost things up on high obstacles. So it is important to finish off your jump impulse and pull up on the bike as it stands quite vertical with the front wheel up. 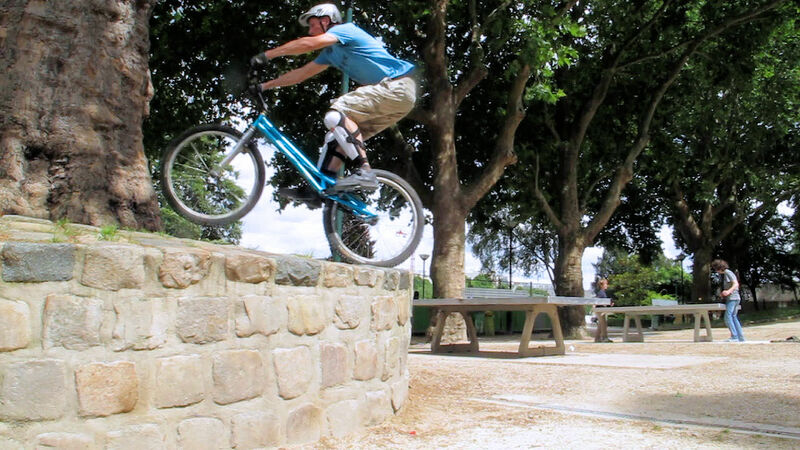 Letting the front wheel drop too low before that second pedal kick will lower your shoulders' position and this could make it more difficult to place your front wheel on top of the obstacle. 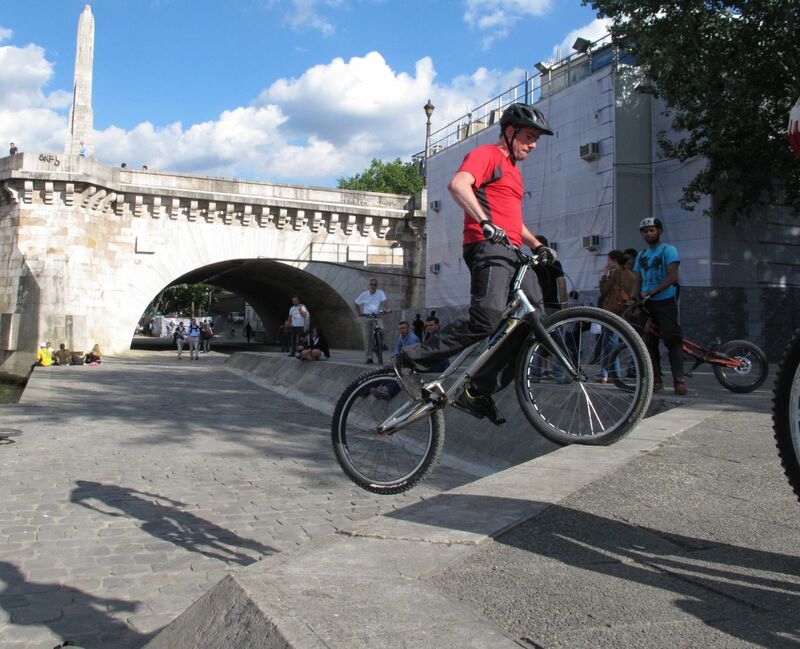 Building your momentum with a pedal up approach will give you more control over the jump impulse but then, tilting the bike will be less obvious. In any case, you must land the front tyre right onto the edge before you tilt the bike. Again, some pros will land this move on just anything, including railings or fences, and carry on with a smooth front-to-back wheel-swap. 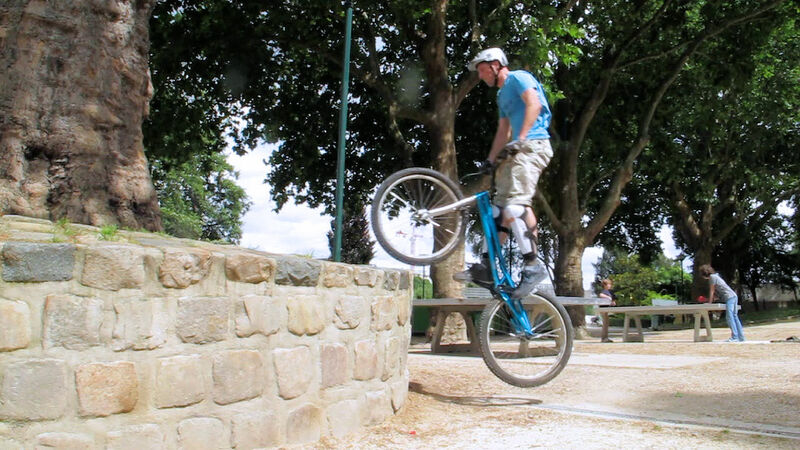 Rémy D. leverages the front wheel support. 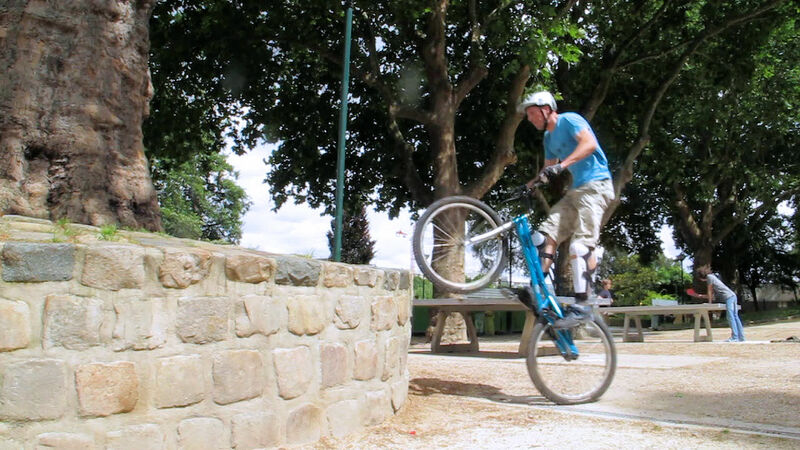 To gain confidence, start on a small obstacle at about a wheel's height to get a good feel. Before you try the frontal approach, it helps to understand the move at an angle of 45°, with your strong foot on the side of the obstacle. 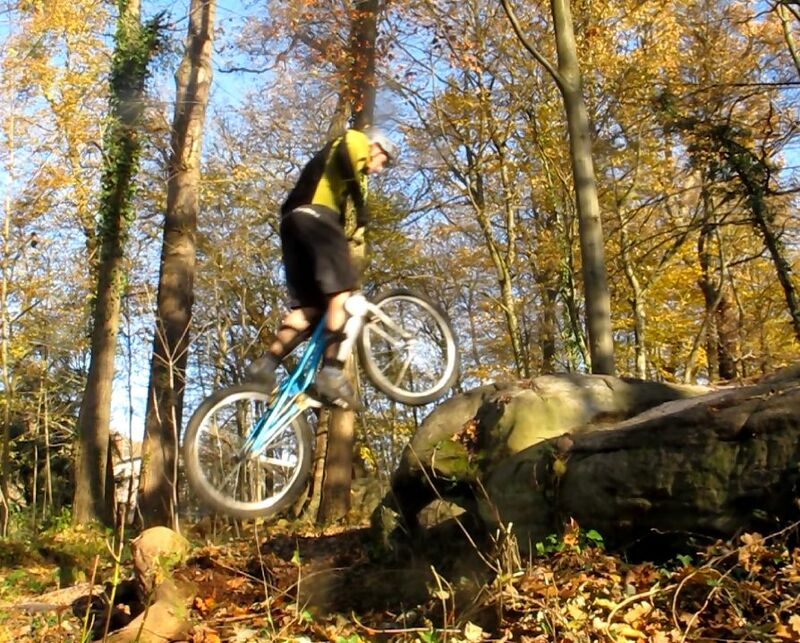 An easy start is to do a basic pedal hop, followed straight away with a basic endo onto a small kerb. 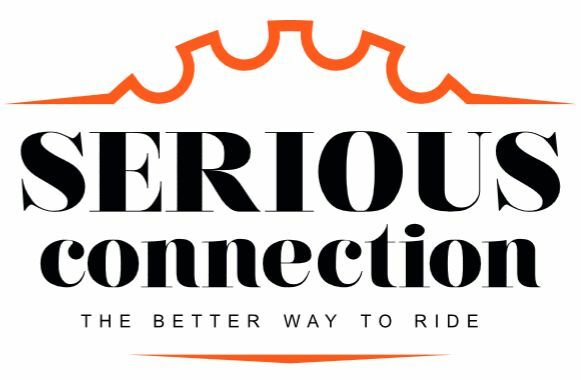 Once you get this, launch the pedal hop faster, let the bike tilt faster and clearly on the front wheel, with enough momentum to lift the rear wheel above the horizontal. Indeed, the faster you go, the easier it will be to lean over the front-wheel, based on your momentum alone. 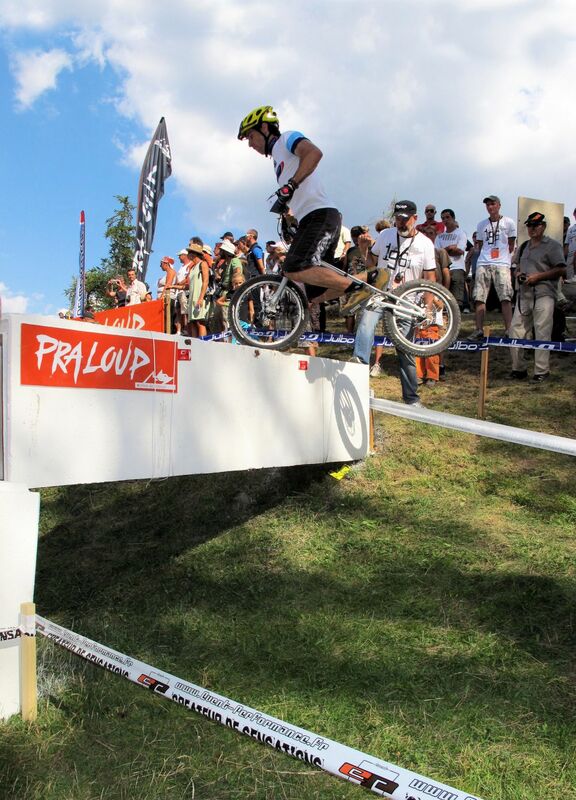 Don't lock your front brake if you land up against a rounded obstacle. 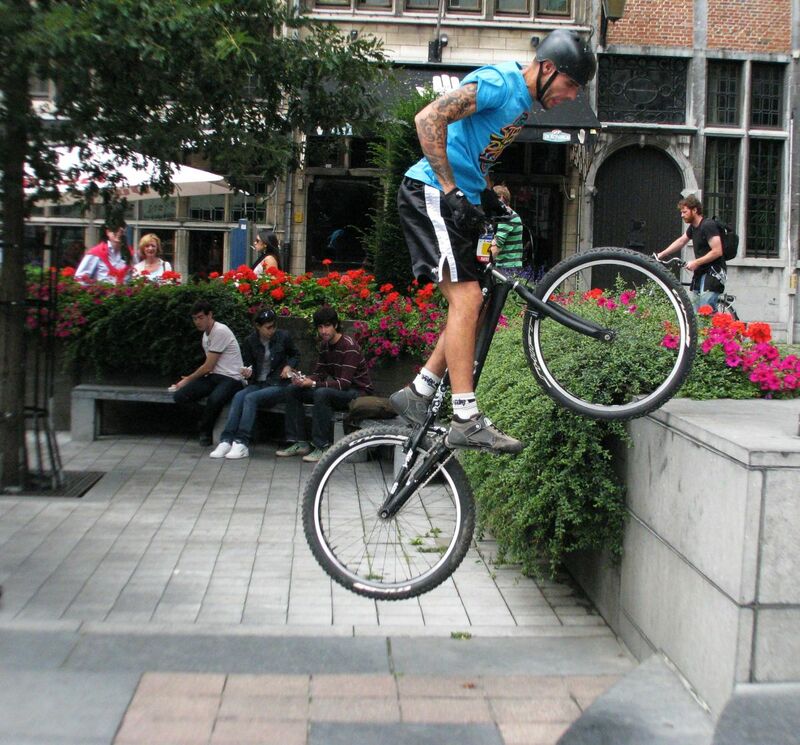 When you reach your upper limit with this technique on rounded obstacles, and you can't land your front wheel on a flat (but against a slanted surface), you should not lock the front wheel upon landing, but simply bounce it off the obstacle and push the bike further up in front of you as you land. So instead, perform the wheel swap in a continuous rolling move, without touching the front brake. This rolling support on the front wheel will allow you to climb high enough to secure your rear wheel onto the obstacle.